Motivation is a broad area of research and is important for innovation. There is no unifying theory of motivation that explains why some people are more motivated to be innovative than others. The question of what motivates people to innovate may not have a clear answer, but some motivational theories offer guidelines on what will or will not enhance innovation. In this post we are going to look at goal setting and its effect on innovation. · Internal vs. External Approaches – are motivational processes external (job design, financial rewards etc) or internal (self-control, expectancy, self-regulation)? · Rational vs. Not Rational Approaches – are motivational processes determined by rational thought (cognition) versus needs, emotions, and personality traits? · Task vs. Social Approaches – is motivation determined more by the task and its rewards/reinforcement verses the influence of culture, groups and norms? 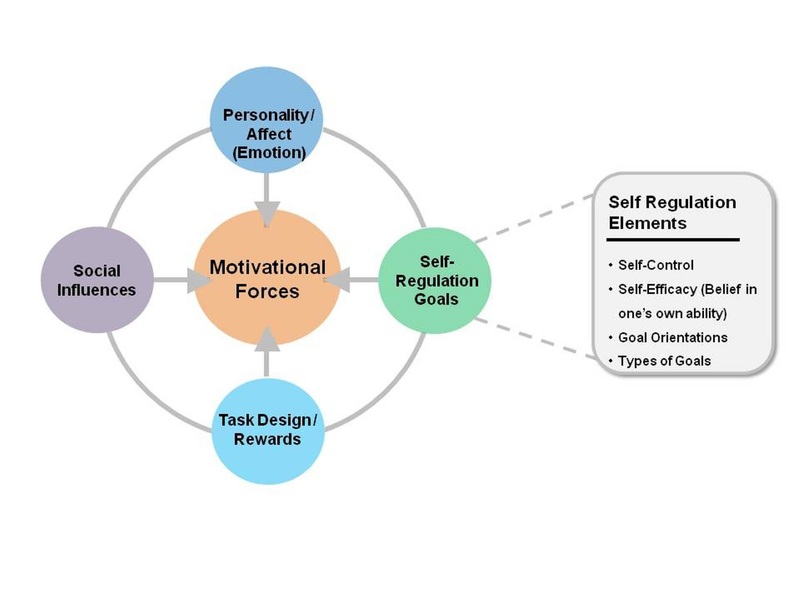 Self-regulation refers to the processes individuals use to set, follow through, and accomplish goals. One element of self-regulation is the types of goals that are set for individuals (or that they set for themselves). Setting Challenging Goals Works … Everyone is familiar with the belief that setting specific challenging goals increases performance. Considerable evidence in research and practice suggests that people do better when they have a specific challenging standard to reach for rather than when encouraged to do their best (Locke & Latham, 2006). Goal-setting works for two reasons. First, it involves a motivational component in the sense that people see the direction, intensity, and duration at which to exert effort. Second, it involves a cognitive component that coaxes people to come up with strategies to achieve the goal (Locke, Shaw, Saari, & Latham, 1981). An example often cited is Weyerhaeuser Company that set specific performance goals for their truck drivers for the number of trips to make per day from the logging cite to the mill. Drivers not only persisted at reaching the goals but also worked with each other to develop strategies and coordinate their efforts to achieve the goals. Performance vs Learning Goals … What are the differences between performance and learning goals? The truck driver example is a performance goal – a goal that stipulates the specific value of the output, the time during which the output is to be achieved, and emphasizes the importance of avoiding mistakes. In contrast, a learning goal emphasizes knowledge acquisition, viewing errors as learning opportunities, and mastery of novel strategies. For example, setting a goal of scoring 70 for a beginner golfer would be a challenging performance goal. Such a goal would send the golfer scrambling and focusing on the score rather than any systematic approach to reach the target. Inevitable failure using this approach would be indicative of poor ability, will reduce self-efficacy and ultimately may result in the golfer withdrawing from the sport altogether. In contrast, setting a specific learning goal of mastering a better grip, position of the feet and improving the swing would be more desirable and effective, as it would remove the need to focus on demonstrating competence and embrace the situation as a learning opportunity. The same could be said of losing weight. Generally, a goal of losing a certain number of pounds is best framed as specific and challenging goal. The number of pounds to lose is a distal, difficult goal that can be structured by adding several proximal, easier goals. For example, the goal may be to reach X number of pounds by date Z1 in order to lose Y number of pounds by date Z2. However, after the goal is reached there is no more discrepancy between the current state and desired state and the goal directed behavior stops. This is why many people relapse and regain the weight they lost in the first place. Supplementing this process with a specific learning goal of learning strategies of healthy eating and exercise may prevent the relapse. At this point approaches that focus on healthy living rather than losing a specific number of pounds are bound to be more effective. Goals for R&D? … Typically, individuals in R&D groups have executional R&D performance goals. These nearly always are related to project specific goals, often in the form of “I will perform task X by Y date”. However in my experience it is rare for innovation goals to be included as part of individual goals. Innovation goals might take the form of “Submit, develop or present X new ideas from Y innovation sessions (or from an innovation process) by year end”. Learning goals do exist but only in a very limited way along the lines of developing new R&D techniques, learning new technical skills (if required for specific projects) and developing new management skills. Learning goals focused on innovation, however, tend to be sadly missing. As discussed previously in one of my earlier posts “Ideation”, innovation benefits from the interaction of creative and adaptive innovators. Not only should an innovation team be diverse in terms of representing different skills/functions within the company but team members should be an even mix of creative innovators and adaptive innovators. Think of “Leonardo da Vinci” types of people as “creative innovators” and “Thomas Edison” types as “adaptive innovators”. Adaptive innovators are skilled at refining and modifying the ideas that creative innovators originate and will generate practical product concepts that consumers want. With respect to setting goals within this innovation culture, creative innovators would benefit most from learning goals whereas adaptive innovators would benefit most from performance goals. What about goals for the R&D group as a whole? Again, there are always performance goals related to projects or products: Typically the goals for an R&D group in corporate America consist of a list of projects in the pipeline and their projected completion dates. Sometimes companies have goals about increasing the value of the R&D pipeline by X number of projects or by Y% of value. However, learning goals for R&D organizations are rare, other than in government scientific agencies, such as NASA. Some Goals may not be Suited for Performance Management … Challenging tasks that require learning new knowledge and skills do not fit well into the “setting specific challenging goals” paradigm. Setting performance goals will force people to focus on error-free performance, time constraints, and specific output. It restricts cognitive resources devoted to learning and mastery of new knowledge and skills required to perform the work well. For example, innovation performance goals as described above may have little effect on innovation. How is an idea evaluated? Will an innovation goal like that described above (“present X new ideas by year end”) generate lots of “me too” ideas? Obviously one“good” idea is worth more than many “me too” ideas. But how can a company keep the pipeline of new ideas flowing? A more subtle by-product of performance goals is that they can create a competitive environment. Competition is a good thing, but it seems to work best only when no development/learning is necessary to accomplish a goal. In a competitive environment people try to maintain an impression of competence, protect their image, and compare themselves with others (Vandewalle, 1997). So while performance goals may work for increasing the number of trips per day for professional drivers who are already skilled drivers, it may not work for increasing the number of innovative products by time X or for presenting Y new ideas by year end. Should Innovation Goals be rewritten as Learning Goals? … Setting learning goals within the context of innovation goals directs cognitive resources to exploring new concepts, generating new ideas/strategies, and testing out new approaches to tasks. It also creates the environment where errors are not feared, and people do not rely on normative comparisons to evaluate their competence. Instead, a person will compare his or her ability against an internal or personal standard. We believe that innovation goals are best written as learning goals and should not be distilled down to quantitative executional goals. We also believe that almost everyone in the company should have some innovation goals as part of their performance management plan. Quantitative Performance Goals within the Context of Innovation may be Detrimental … Research on innovation indicates that effective idea generation depends on information seeking, questioning, and experimentation behaviors (Patterson, 2002). These are the behaviors that are naturally suppressed when performance goals are set. Performance goals by definition imply that skills are there, and no information search or learning is necessary to accomplish the goal (Seijts & Leitham, 2005). Learning goals imply that there is time and flexibility for imagination, discovery, testing new ideas, and developing new strategies. Because one of the conditions of innovation is flexibility and availability of resources to spend on new idea generation and testing, learning goals are perfectly appropriate to encourage innovation (Damanpour, 1991). Summary … Time is in short supply for business today and effective innovation is critical for business to have a competitive advantage. Any technique or tool that promotes learning goals required for innovation, such as setting the right innovation goals, could be productive in the long run. If your company is trying to innovate, take a look at the goals you are setting for your employees and your R&D department. If you are willing to invest in setting the right learning goals that are needed for innovation, you might create a more innovation-inspired workforce that creates more innovative products. Amabile, T. M., Schatzel, E. A., Moneta, G. B., & Kramer, S. J. (2004). Leader behaviors and the work environment for creativity: Perceived leader support. The Leadership Quarterly, 15(1), 5-32. Damanpour, F. (1991). Organizational innovation: A meta-analysis of effects of determinants and moderators. Academy of management journal, 34(3), 555-590. Locke, E. A., Shaw, K. N., Saari, L. M., & Latham, G. P. (1981). Goal setting and task performance: 1969–1980. Psychological bulletin, 90(1), 125. Seijts, G. H., & Latham, G. P. (2005). Learning versus performance goals: When should each be used? The Academy of Management Executive, 19(1), 124-131. Patterson, F. (2002). Great minds don’t think alike? Person-level predictors of innovation at work. International review of industrial and organizational psychology, 17, 115-144. This post was written by Bogdan Yamkovenko and Dennis Nelson. Bogdan suggested the topic initially and his biography can be found below. Bogdan V. Yamkovenko, Ph.D., is a senior consultant with Philosophy IB. Previously he was an assistant professor in the Department of HRD at Rochester Institute of Technology, an assessment and education research specialist with the Shaw Group in Washington D.C., and a management consultant with Accenture. His areas of research interest focus on the differences in self-regulatory mechanisms, specifically, goal orientations, dispositional influences on goal orientations, and how goal orientations can be manipulated in the work setting. Additionally, Dr. Yamkovenko is interested in the influences of goal orientation on transfer behaviors and learning and development, the differences in global goals people set and the discrepancies between these goals and work task/achievement goals, and the influences of affective states on trait and state goal orientation. Dr. Yamkovenko is an active member of the Academy of Human Resource Development and has presented in international HRD conferences and published in HRDQ, HRDR and other journals. He is a member of the steering committee of Quantitative Methods Special Interest Group in the AHRD. The learning and performance goals differ in content such that the output of the performance goal is an actual business-relevant performance outcome. Learning goals result in the skill increase, knowledge expansion, feedback seeking and experimentation. Both still must be specific. Specificity of the goal is a characteristic that can vary for both learning and performance goals. Timing of the goal output (learning or performance) is also determined and the goal should not be open-ended. There is some research that suggests that time pressure in a learning goal may reduce information sharing. It may also restrict the range across which the learning occurs. Whether this affects creativity is a subject of debate. A recent study by Amabile (2004) shows that creativity in teams is reduced when time constraints are in place due to reduced information sharing and increased anxiety.